Here's OPI Silver Shatter over Essie Nice is Nice. My next post will hopefully have a new design! I can't seem to stop doing these flowers. I'm heading off to New York City tonight and I wanted to do this manicure for the trip. I thought it would be simple yet eye-catching. However, these nails lasted a total of one day because I ruined them while making the bed. Story of my life. I used Sally Hansen Insta-Dri Beige Blast as a base with American Apparel Manila and China Glaze For Audrey for the flowers. I've been busy lately and I've deemed my recent nails as not worthy to publish online. Last night, however, I finally painted a satisfactory manicure. This is very similar to a previous design I did but with a different colour scheme. I'm super excited for summer vacation and the weather has been great lately so I painted my nails to match. I didn't realize that these colours would be so difficult to photograph! As a side note, I highly recommend this design to anyone of any skill level. As long as you can use a dotting tool or even a tooth pick, these flowers are goof proof and always turn out pretty! I used China Glaze Breakin' as a base with American Apparel Poppy on the free edge of the nail for a subtle gradient. I layered that with a coat and a half of China Glaze Cherry Pie. 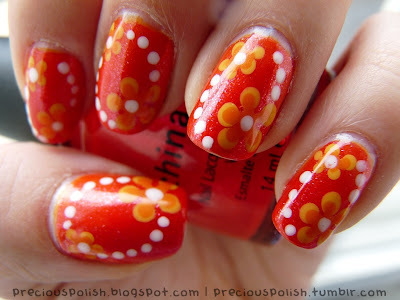 I used China Glaze Breakin', American Apparel Manila and a white striping polish for the flowers and dots.